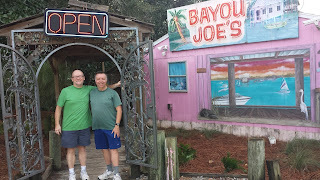 Living Life by Design - with Alan and Mark: Bye Bye - Garbage Food - Rosa - Joy - and Black-Eyed Peas! Bye Bye - Garbage Food - Rosa - Joy - and Black-Eyed Peas! Bye Bye - Garbage Food - Rosa - Joy - and Black-Eye Peas! 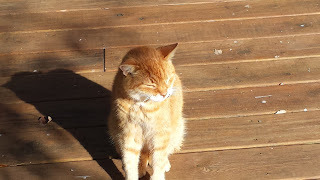 We were sad to say bye bye to Alexander on Wednesday morning. He had become a central part of our lives over the last two weeks and, already, our laps are feeling cold and neglected! Ally's mom, Helen, and her best pal, Amy, joined us for breakfast at Bayou Joe's down at the Panama City Marina before we started our northward journey home. 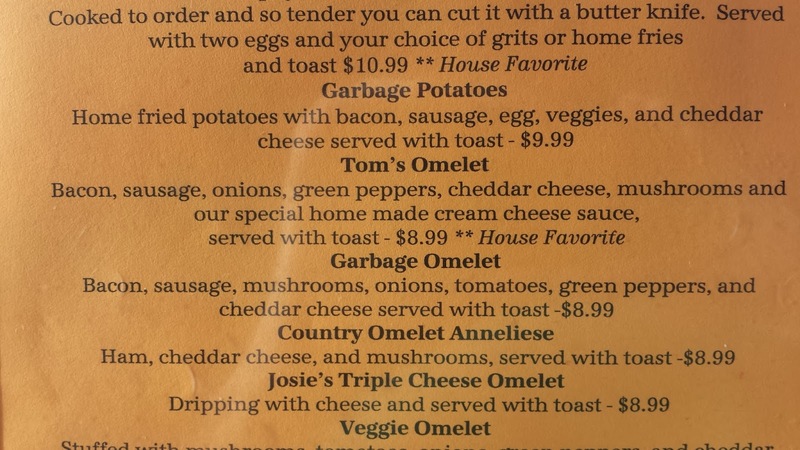 We all chose one of the 'Garbage Specials'. 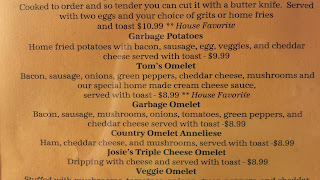 It was the best 'garbage' we'd ever eaten - not that we've made a habit of it!!! Any 'Garbage' choice is good, here! We are loving this House/Pet sitting adventure, not least because we get to meet some fantastic people. Helen is awesome, and saw to it that our stay in her beautiful house was comfortable, enjoyable, and felt like home away from home! 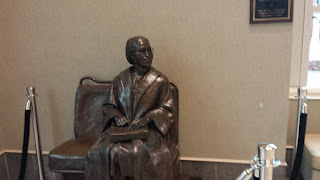 We are delighted that she has invited us back and are looking forward to cementing our friendship with her. She is certainly one of life's treasures. It was fantastic to get to know Amy, and we got to spend quite a lot of time with her - especially on Christmas Day. There is never a dull moment with Amy, and it was easy to love her. 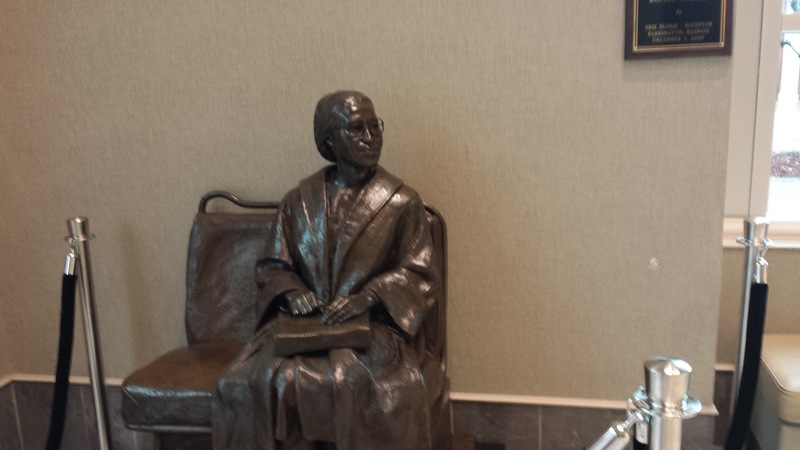 We're looking forward to seeing more of her during future visits. After departing Panama City, we headed north to our first destination on the way home. 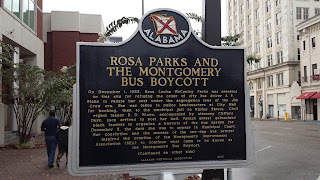 Montgomery, Alabama, is a lovely city, and is home to the Rosa Parks Library and Museum, which is why we chose that route. 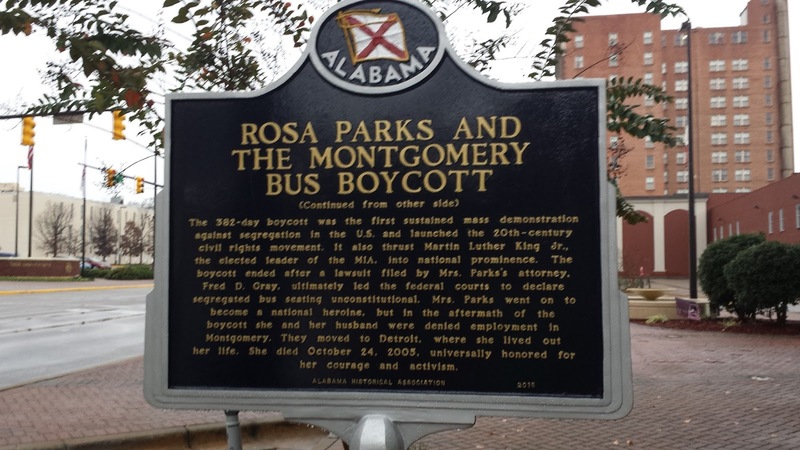 Rosa is often called the mother of the Civil Rights Movement because of what happened after her refusal to give up her seat on the city bus, back in 1955. She was 42 at the time, and it happened to be her birthday. 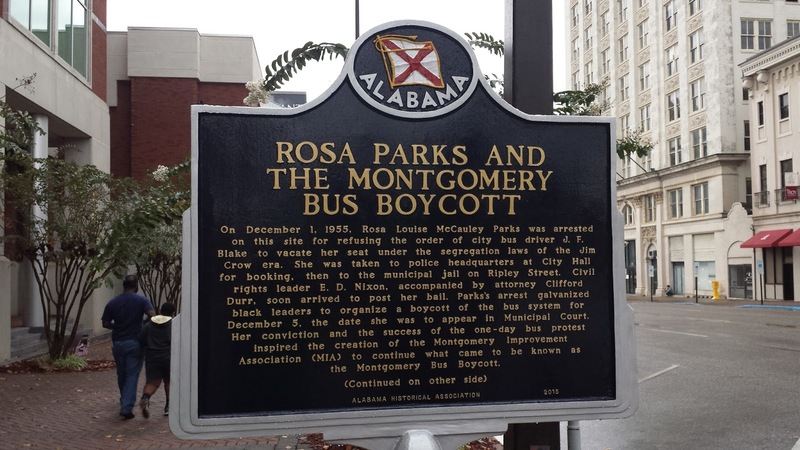 This action led to her arrest and subsequently triggered the Montgomery Bus Boycott which, in turn, led to the beginning of the breakdown of racial segregation. Rosa lived to be 92 and received numerous awards and medals. 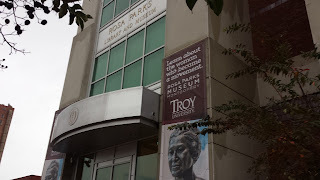 The museum dedicated to her, and to the events that followed, was opened in 2000 at the intersection where the arrest took place. Her story is uplifting and inspiring. Two years ago, on an earlier road trip, we had the honour of standing in the very spot where Dr. Martin Luther King Jr. was assassinated - an experience I will never forget. 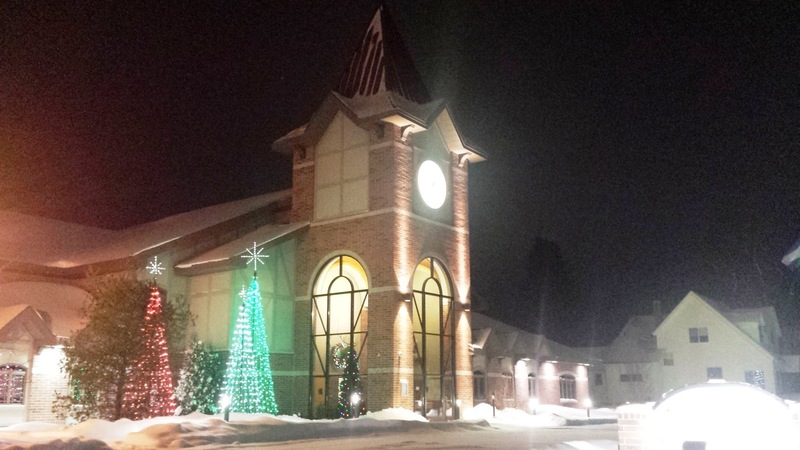 (Check out that blog by clicking this link). The same sentiment was present standing in the spot where Rosa Parks was arrested. The bravery of these individuals, who stood up for human rights at the expense of their personal safety - and at great personal cost - leaves one feeling very humbled indeed. The next morning, we set off for our next stopping place, passing the city of Nashville on our way to Louisville, Kentucky. 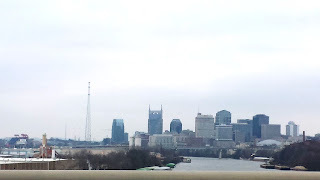 We had spent two days in Nashville on our way down to Florida, so we satisfied ourselves with just one photo of the city in passing. Arriving in Louisville in the late afternoon of December 31st, we decided to treat ourselves to a New Year's gift of a movie by seeing the film, 'Joy', with Jennifer Lawrence, Bradley Cooper, and Robert De Niro, along with a brilliant cast. The movie was funny, but also had a great point to make about perseverance and belief in one's self. It's on our list of movies to watch again when it comes out on Netflix. (Here's a trailer for the movie to give you a taste of it). Interesting to note: there were three movies we have been wanted to see. 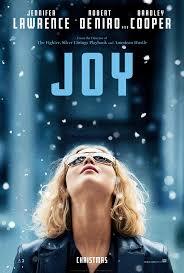 However, as Jennifer Lawrence was born in Louisville, it seemed appropriate to watch this movie in her home town! This morning (New Year's Day), we left Louisville for Mackinaw City, Michigan. 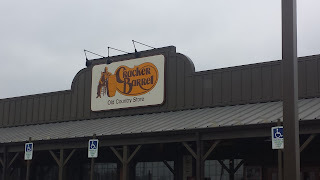 Before leaving Indiana, we stopped in for lunch at a Cracker Barrel restaurant, as it had been highly recommended by a friend and was advertised as being 'light on the wallet'! We were amazed at the service we received, as well as the quality of the food we had chosen. As it was our first visit, the waitress treated us to free coffee! As well, we were both given a free serving of delicious black-eyed peas, together with biscuits and butter. 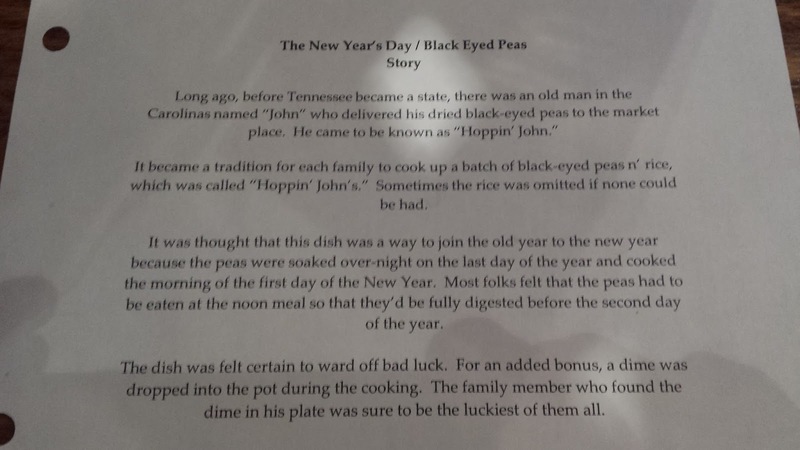 Apparently, this was an old tradition that happens every New Year's Day! Once again, it was a case of being in the right place, at the right time! 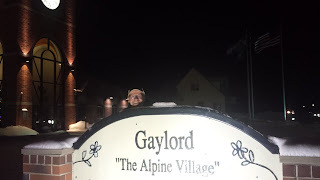 As we closed the gap between us and the northern part of Michigan, we were placing friendly bets as to when we would first encounter snow. There were dustings of white showing in the northern part of Indiana; but it wasn't until we got into central Michigan that we saw the gradual build up. That being said, we couldn't have asked for better weather for traveling, and the roads had all been cleared and were in tip-top shape. 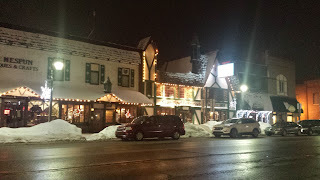 Just before we reached Mackinaw City, (where we visited in June of last year), we stopped off in Gaylord, Michigan, to see the holiday illuminations. Mark wanted his photo taken by the sign (we'll leave you to guess why!!). The journey today took just under 11 hours, with a few stops to answer the call of nature and to eat our lunch. 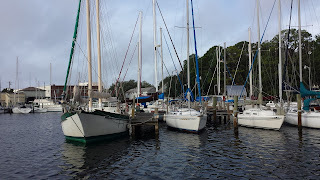 We're glad that we won't have to be in any hurry to get up in the morning as we'll take another look at Mackinaw City before crossing the Mackinac Bridge and making our way to the Canadian border. It feels good to know that tomorrow, we'll be home within four hours! Impromptu Days are the Best!! !